SCYDynamics is our version of a System Dynamics modeling software. 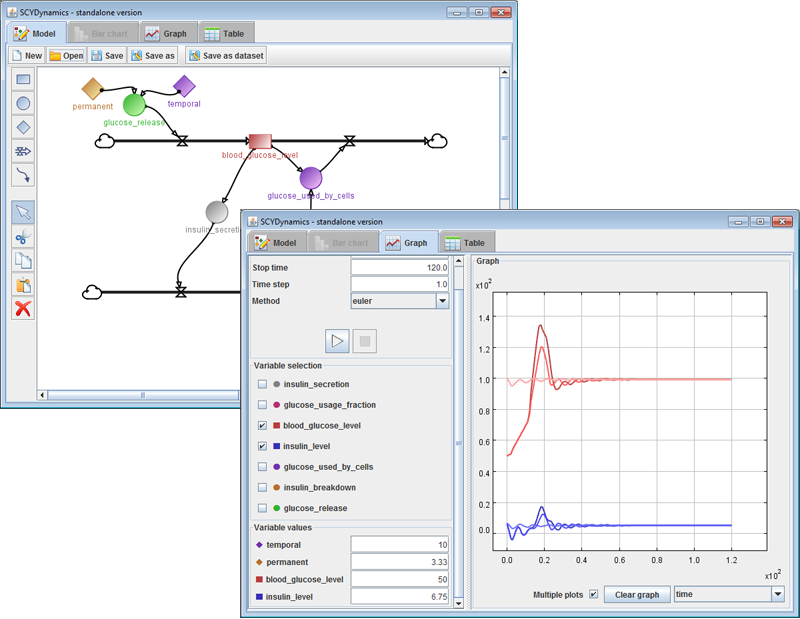 You can use it to create and run models in the System Dynamics modeling language. In a short time we will add the option to specify models in a qualitative way. You can run the tool via Java webstart here. A few example models can be found here: examples.zip. Simply download, unzip and load into SCYDynamics. Would it be possible to add an if-statement and more mathematical functions such as sin, cos, exp, etc etc? I would like to model a parachute jump, and at some point in time (or better: when the height is less than 1000 m) the frontal surface of the parachute will have to increase, which I can’t seem to do right now. Dear Bart, most of the functions you mentioned are available in SCYDynamics, like sin(), cos(), exp(). The if-statement, however, is not available, and we are not going to implement this in the Java version, since we are planning for a web-based version in the future. I’ve done workarounds for if-statements in the past using combinations of min/max/abs-functions. I am not able to open SCYDynamics. When I try, the application gets blocked by the security settings. I already tried it without my windows firewall and norton security, but the application keeps getting blocked. What can I do? You will need to lower the Java security settings. You can do this by going t0 the Windows control panel and open the Java control panel. next go to the security tab and set the security level to medium. Next time you start the java application you should still get a warning but with the option to continue away. Thanks for the reply, looking forward to the web-based version! Is it possible to add a power of ten expression in the constant field. I am making a simulation of a satellite orbiting the earth, the earthmass is 5,972 *10^24 kg. Very inconvenient to enter without the power of ten. Also is there an overview of mathematical functions (like sin, cos, log etc.) that can be used.